Glam Media on Tuesday announced that they have completed the acquisition of social media network Ning, a move that provides Glam Media with an overall userbase of 250 million monthly unique visitors, making the company the second largest social network in the world. As part of the acquisition Ning co-founder and chairman Marc Andreessen has joined the Glam Media board of directors. Under the Glam Media group there are now more than 100,000 publishers and content creators including Ning users. 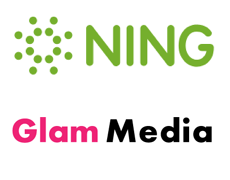 The Ning network according to company documents will continue to operate as a subscription service under a new business unit at Glam Media. Also joining Glam Media is Ning’s former CEO Jason Rosenthal who will talke on the role of EVP Social Media & General Manager. The company is expected to integrate their own premium advertising solutions into Ning’s platform in the coming months while accelerating the company’s plans to help brand marketers engage with passionate social communities that typically serve niche user intentions via the Ning platform. Ning was forced to convert into a subscription model after brand advertising failed to turn a profit, do you think Glam Media and their expertise in the online advertising space can help Ning turn around their advertising platform and make the Ning network platform profitable as planned?